This summer my wedding emergency kit has been extremely handy and has got me thinking anout common wedding pitfalls and how to avoid them. We all know that you can't rely on a British summer but rain isn't the only problem. Extremely hot weather can be hazardous too and snowy winter weddings can mean guests have trouble reaching remote venues. 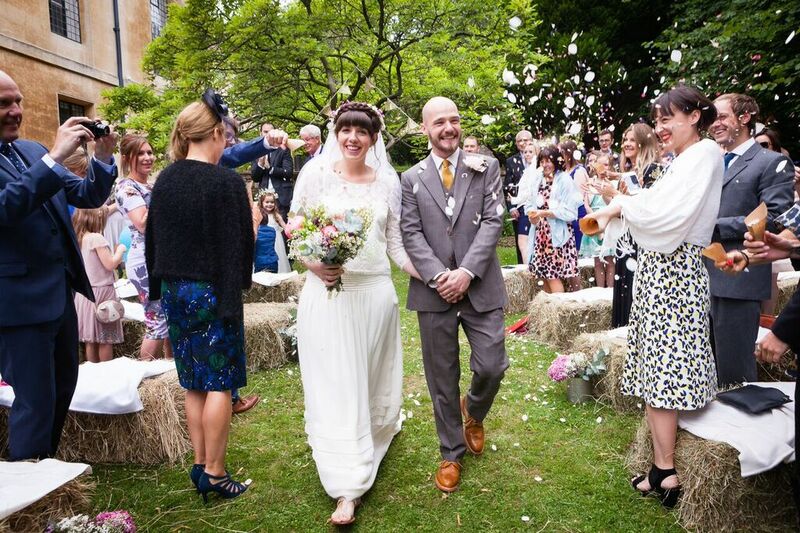 For summer weddings it's essential to have a wet weather plan to fall back on. Make sure there is an indoor space available for all parts of the day and that you have plenty of big umbrellas on hand even if the forecast is dry. They can also make great parasols if it's very hot. 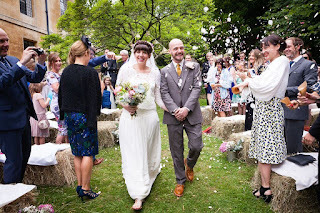 If you'd love a fabulous outdoor ceremony like Jane and Gavin then always have a back up venue inside, just in case, as cold wet and miserable guests don't create a fun wedding atmosphere. Try to provide shade if you're having drinks outside during the hottest part if the day and it's handy to have sun cream and bite cream available for guests just in case. I've seen lots of bridesmaids in strapless dresses end up with sunburnt shoulders. If you're having a marquee then ensure it's watertight with plastic under the flooring and ideally wooden flooring on top. Make sure any walkways are carpeted and covered too if possible to keep guests dry and to avoid traipsing muddy feet into the tent. It's also worth checking if your venue is prone to flooding as this could spell disaster with long periods of heavy rainfall. For winter weddings make sure your venue is easily accessible if it snows or the roads are extremely icy. Ask them if they have grit on site or what they do to ensure guests are safe if there are hazardous icy conditions. Check if access roads to the venue fall under council control as private lanes or tiny B roads are rarely cleared or gritted. It's great to have some supplies on hand for guests or the bridal party particularly in a remote venue away from shops. My emergency box contains a small first aid kit, blister plasters, pain killers, feminine hygiene products, mints, tissues, deodorant, hair spray, shoe laces, tweezers, scissors and much more. I have handed lots of items out to guests in need and seen many broken zips and dresses so safety pins are a must too. Batteries are always a good idea and I've used them for cameras, fairy lights and for a guest's crucial insulin pump. At a few weddings I've coordinated the day has been held up by guests getting lost on the way to a venue and at one wedding two taxis took guests to the village of Wick instead of Wick Farm. Avoid confusion by giving your guests as much information as possible in advance such as maps, sat nav postcodes and providing them contact details for the best man or usher if they get lost. Try to avoid long periods where the guests are hanging around unsure what's happening or when they'll be fed. No one wants bored or hangry guests! It's also good to provide lists of hotels and taxi numbers for those who don't live locally or if the budget allows, arrange a mini bus or people carrier to shuttle guests back to their hotels. A running order of the day also helps guests know what to expect and helps to keep the day running smoothly. There's been a few occasions when setting out place cards that you find one is missing. To avoid this problem sort them into tables and seal them in order into envelopes with the table name or number written on. This also makes setting out the place cards really fast and easy. If you've hand written them it useful to give the pen and a few spare place cards to whoever is setting up the tables just in case. Make sure to double check you've packed everything for the tables and label decor boxes clearly with where it should be placed. This does happen and fairly often! If you spill something on your wedding dress try to scrape it off with a knife if it's solid or if it's liquid try to absorb as much as possible with tissue first before wetting or rubbing. Baby wipes are great for quick stain removal or you can buy stain removal wipes in most supermarkets. White chalk is a great way to disguise stains on a white wedding dress. Most wedding suppliers are super reliable and will deliver what they've promised on the day but it's still a good idea to confirm arrival times and venue details before the wedding. Make sure there is a list of all suppliers and you have a mobile number for each in case you need to reach them on the wedding day. Give this list to the best man along with a list of key timings for the day. If you need someone on hand to contingency plan or deal with any emergencies, my On the Day Wedding Coordination service is ideal. Visit my weding planning website to find out more. I got married there earlier this year and cannot say enough positive things about the entire experience of working with their manager and the service, food and venue. The coordinators from wedding venues Los Angeles managed my wedding, and were impeccable wedding Angels. I agree with everything you say in this useful piece. As a celebrant, my car is always full of emergency supplies!